Yamaha’s Jorge Lorenzo is saying goodbye to the Japanese factory this weekend as he prepares to move to the Ducati factory team next year. 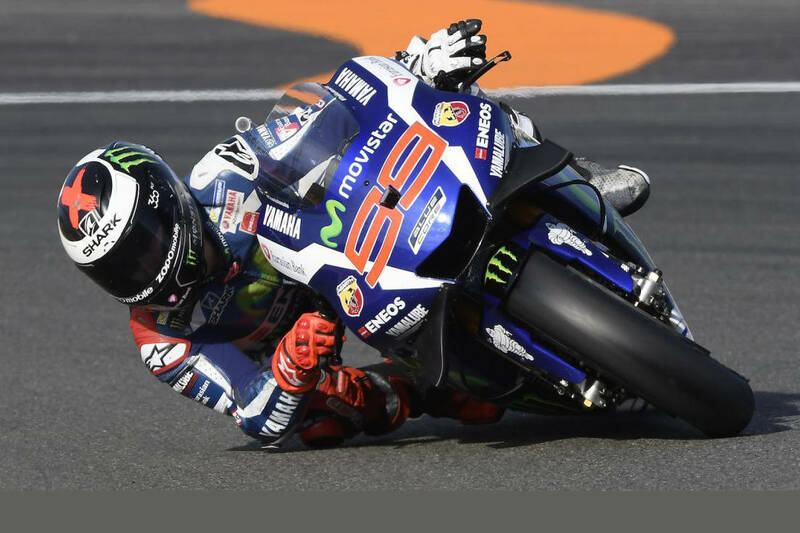 Lorenzo has been on fire all weekend at the Valencia circuit he loves (where he secured the title last year with a victory). He obliterated the lap record today to take pole position for tomorrow’s race. Filling out the front row in second and third, respectively, are new champ Marc Marquez (Honda) and Valentino Rossi (Yamaha). Although we are only presenting Q2 results below, you may want to note that KTM factory test rider Mika Kallio improved a bit from his dismal performance yesterday, and qualified in 20th position ahead of MotoGP regulars Tito Rabat (Honda) and Yonny Hernandez (Ducati). Pos. Num. Rider Team Bike Km/h Time Gap 1st/Prev. Watching him in qualifying, I had to keep reminding myself that he was aboard a 250bhp monster. His combination of control and speed were astonishing. JLo was riding smooth and fast in qualifying. Incredible lean angles. Marquez almost got him, but looked totally out of control as he usually does. Too bad this is the last race. I have enjoyed the season immensely.